Holiday time and food just plain go hand-in-hand! Whether it is making a time-honored and well-loved recipe, sharing a meal with a group of special someones, or giving a gift of specialty food goods, the holidays…involve…food. Henceforth and ergo, we at CTBites would like to add a few items to your list. No need to check these twice, we can tell you right off that they are worth sharing! From pottery and chocolates to classes and luxury trips, there is something for every person you will be shopping for this season. Our great Nutmeg State is simply brimming with artisans and people who are making delicious, beautiful and fun products or offering experiences that enrich our lives. Enjoy these, enjoy *giving* these, and enjoy the smiles that will result. Have a wonderful holiday season, everyone! May it be delicious! Monica and Todd Brown have created not just a market for artisanal cheese, soulful wine, and food-inspired wares, but also a space that reflects their personal philosophy. Cheeses and charcuterie are attended to and hand-selected by cheesemongers. Yes cheesemongers! Terroir-driven wines have been made by families and farmers, not corporations nor conglomerates! Gourmet foods are created with love and no funny stuff, and unique wares on which to beautifully serve them. Come in to touch, taste, and experience these exceptional crafts for yourself. How can you resist? With every item on the shelf, there's a story. The newest chapter in that story begins with Farmhouse Pottery, handmade by potters in Woodstock, Vermont. This line of pottery is functional, beautiful, and meant to be used and enjoyed by generation after generation. Produced using old techniques and simple tools, these bowls, pie plates, and other kitchen items to grace your table (and counters, and shelves…) will add beautiful, earthy notes that reflect a true authenticity. and downright fun adult cooking classes. Fun and food go hand-in-hand, you know! Alison’s educational and restaurant/catering chef background create a learning environment that is high energy, entertaining and informative all at the same time. Go solo and meet some new people or head over with a group of fellow food lovers and hop the train to Flavor-town! These 2 hour classes will have your special someone creating three to five dishes (and learning endless “chef shortcuts and tips”). Their winter class offerings range from Valentine’s couples classes, a Chinese New Year class, fish classes, sauce classes (how saucy!) and oodles more. The gift certificates are valid for one year, so your cooks-in-training can choose what season floats their boat, culinarily speaking. Great for anyone wanting to learn something new, brush up on techniques or just have a unique evening out. Check them out on Facebook to stay up-to-date to AMG happenings and news. Brown Dog Fancy thinks that “mustard and ketchup shouldn’t be fancy, and it shouldn’t be artificial. It should just be good”. And we can’t argue with that! 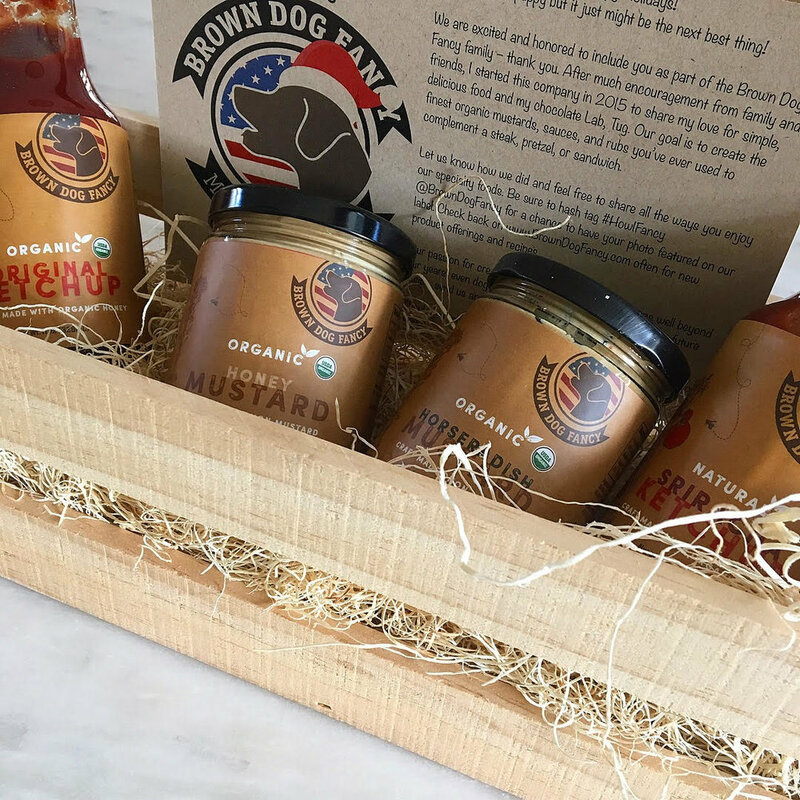 These are organic, preservative and GMO-free condiments that shake up traditional notions of what makes a great-tasting condiment or marinade. Containing ingredients that are natural and pronounceable (crazy idea, right? ), they source raw black honey from Pennsylvania (honey is the only sweetener they use), organic Dijon and brown mustard seeds from upstate New York, and spices from California, just to name a few items that go into their authentic finished products. They aim to do justice to high-quality meat, poultry, fish—and even a cocktail or two. Their lineup includes two ketchups (All Natural Sriracha and Organic Original) and four mustards (Honey Dijon, Horseradish, Spicy Horseradish, and Spicy Mustard). All are made in small batches and as Brown Dog Fancy says, you can use their mustards and ketchups to “dip, spread, spruce, glaze, brush and love”. The possibilities are endless. Perfect for a cook that you know who just wants to add that extra zing. Zing! Offering classes for adults and kids alike, Cinch Gourmet holds classes for small or large groups, private or corporate. They also offer “Chopped”- style competitions for private groups up to 24 people. Laugh and cook with your friends and see who comes out on top! Cinch can also accommodate small, private parties for up to 40 people with cooking demonstrations-a holiday party like none other! Examples of past classes are Happy Hour, Gastro-Pub Night, Spain Tapas, Cooking with Wine and The Sole of a Fish. Give the gift of knowledge (and you’ll probably benefit from a great meal afterwards!). Does the New Year's resolution to eat (and cook) better sound familiar? Do you know someone who wants to learn more about what they consume? From nose-to-tail, get to know your food! Make this goal attainable by giving the gift of knowledge to the carnivores on your list with a Fleishers butchery class! Their workshops are a unique, hands-on experience where you'll gain kitchen confidence, eat and drink (BYOB) while learning from experts, and take home lots of raw meat for future practice. Beef butchering, sausage making, roasting, plus everything you could want to know about pork or poultry-these are perfect activities for dates, group outings, and team building. Sign up online or stop by the store for a gift card! We guarantee you’ll even learn about some parts you never knew these animals had. Head to Noteworthy’s website, choose your size, flavor (Smooth Milk, Classic White, Golden Dark), “Flair” and your message. Ta-Dah! 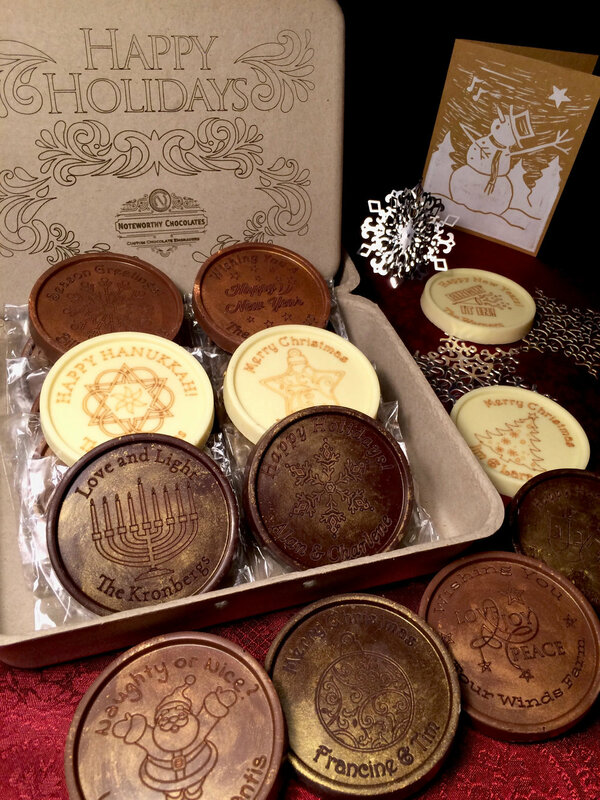 You’ve just engraved…chocolate!Their chocolate medallions are delectable and beautiful holiday gifts and can be personalized with over twelve holiday designs. Sweeten up a gift basket or accent a bottle of wine (and we all know how well chocolate and wine pair-perfectly). Bring them to work to celebrate the season with colleagues, or show how much you appreciate your employees and clients. Give them to teachers, bus drivers, helpful neighbors, or the awesome person who makes your coffee every day (hint hint, wink wink). Noteworthy Chocolates are the world’s *only custom chocolate engraving service*. How cool is that, right here in Connecticut! And this is a gift to be savored and enjoyed…perfect for that person on your list who doesn’t want more “stuff”. Their chocolates are allergen-friendly, kosher, fair-trade certified, peanut and tree nut-free, and gluten, soy, and GMO-free. The dark chocolate is even vegan. On top of all this goodness, the packaging is environmentally friendly, too. This is a gift with virtually no footprint except for a happy belly. Psst-They ship anywhere in the continental U.S. Chocolate for all! Stew Leonard's Wines of Norwalk, a four-time winner of Moffly Media’s “Best of the Gold Coast”, is known for the personal service it provides to customers and also for its knowledgeable staff, many of whom are certified wine professionals. It’s always good to have people-in-the-know in your corner! This holiday season, the store is offering a selection of gifts for wine and food lovers like their customizable food gift boxes and wine packs such as the “Red and White Collection”, the “All Red Explorer”, or the “Mystery 3 pack”. The also have great gifts such as the revolutionary wine access system, Coravin, which allows wine drinkers to pour wine by the glass without pulling the cork-practical, new and clever! There are also gift-able craft beers and spirits, many of which are highly sought-after, as well as personalized one-of-a-kind gifts via their website. Be sure to sign up for Stew Leonard's Wines of Norwalk email list to be notified about in-store custom engraving events with Johnnie Walker, Josh Cellars, Guinness, Eagle Rare and Buffalo Trace. The Oysterman's Daughter is a lovely, small hidden shop located at the boatyard where Copps Island Oysters are harvested and distributed. If you love nautical or beach-themed gifts, head here for cookbooks, tee-shirts, beach bags, coasters, candles, pillows (“Eat Sleep Boat”)-a well curated assortment of sea-salty goodies for home, boat, beach and your dinner table. Their Shucking Kit is a perfect holiday gift for any oyster lover. It includes a shucking towel, shucking glove, oyster knife, illustrated guide on how-to-shuck along with a gift card for 2 dozen oysters, all cutely nestled in a Mason jar. Aw, shucks! You can even send the freshest lobsters, oysters, clams and cocktail sauce to that shellfish lover on your list. Make dinner is on you this holiday season. shirt?). This Connecticut-based lifestyle brand a one-stop-shop for all of your gift-giving needs. Their popular products celebrate Connecticut and give customers of all ages a tangible way to “rock their CT pride”. This homegrown start-up company was started by a brother-sister duo with a BIG passion for their home state! “Every cheese as a story” proclaims Caseus…and don’t you love a good story? In addition, every food at Caseus has a story and they love to share it with you. 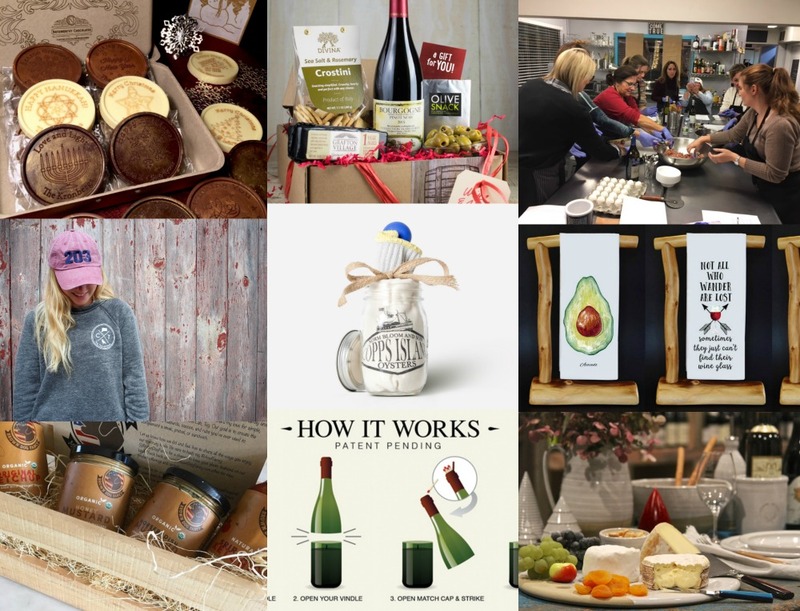 Beginning with cheese and venturing to jams, cookies, charcuterie, coffee, chocolate, vinegars and olive oils, every item that Caseus stocks has been chosen for its authenticity and uniqueness. This business strives to know the farmers, the suppliers, how foods are made and then pass that deliciousness and information on to you. They offer a Cheese of the Month Club, which is a 3 or 6 month subscription of 1/2 lb. of seasonal cheese, a recipe, the “cheese story” and facts. They also have cheese pairings classes and gift certificates and a delightful bistro. 100% cotton “laid back luxury” kitchen cloths that proclaim everything from cheeky slogans such as “May your coffee be stronger than your toddler” and “Let that Shittake go” to designs that support charities both home and away, such as a the Sandy Hook Promise, Joyful Heart Foundation and various animal rescue organizations. Slogans and illustrations are printed on modern plain weave towels or traditional flour sacks and have a hang loop and pouch. These make great hostess gifts, or even a clever wrapping for a bottle of bubbly or a pile of cookies. From the woods of the aptly named Woodstock in the Quiet Corner of Connecticut, come handmade artistic gifts for kitchen and table. Utilizing New England cherry, black walnut, birch and maple woods, Meb and Tom make every single item that emerges from their workshop; not-your-typical serving and cutting boards, knives and spreaders, tongs, trivets, salt cellars…they even do custom orders. If you can imagine it, they can probably make it. These are pieces that will enhance your home and last a lifetime, with the colors and beautiful grains of natural wood. Tom and Meb speak for the trees. A small groups of travelers, hotels in swoon-worthy locations, dinners at local restaurants (many Michelin starred), cooking classes with professional chefs and food…lots and lots of traditional food. On these trips, you will visit little nooks and crannies that the average traveler might miss. Tours range from a 10-14 days and will take you to locations such as Umbria, Rome, Sicily, Puglia, Spain, Piedmont. Choose your adventure, and be prepared to be nourished body and soul. Book soon! Join this boutique tour company and travel to Sicily in April! Limited to 12 people, this intimate tour will introduce you to the tastes and sites of this beautiful Italian island. Headed up by a native Sicilian (who now resides in Ridgefield) and a Wilton resident who is a certified wine educator, you will be in good, knowledgable hands! This tour includes a trip to Mt. Etna, guided tours of wineries, dining at Michelin-starred restaurants, a cooking class, and a tour of the Valley of the Temples Greek ruins and other historical sites. Bene! Bene! Book by January 15th for a discount. Female owned and operated, this facility has a partnership with a vineyard in Suisun Valley in California, which is particularly known for Petite Sirah, Merlot, and Cabernet Sauvignon. 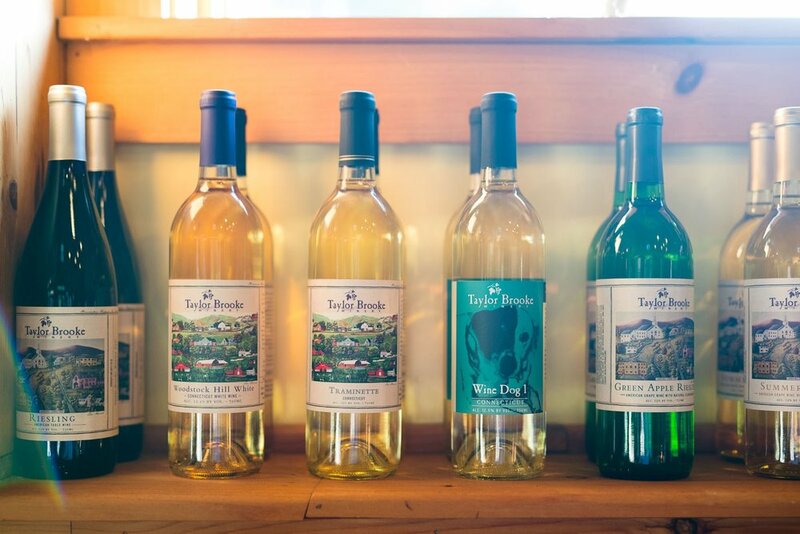 Make way for winemaking in Connecticut! Here you can make your own wine (just like Lucy! Press, rack, bottle, cork and label! ), take a Blending or Wine Appreciation Class, even get out your Pinterest ya-ya’s and CRAFT at the winery. “Doing” gifts are so much fun, aren’t they? And with these, your recipient will see the fruits of their labor. Also in Woodstock (the Quiet Corner isn’t looking too quiet now, is it? ), at Taylor Brooke Winery, you can Adopt-A-Vine at their vineyard in this bucolic section of our state. With your “adoption”, you are given the opportunity to take part in the wine growing experience and results in taking home a bottle each season for 3 consecutive years. When you come in to redeem your first bottle, you will be taken for a tour of the vineyard and winery (if exceptionally busy or weather is inclement, this may be reserved for your second or third visit). Adopt-A-Vine makes a great gift for someone who enjoys the “process” or who wants to learn more about wines and their origin. Please note, this winery does not ship, so all bottles must be picked up at the winery. Make it a road trip or a lovely weekend getaway! 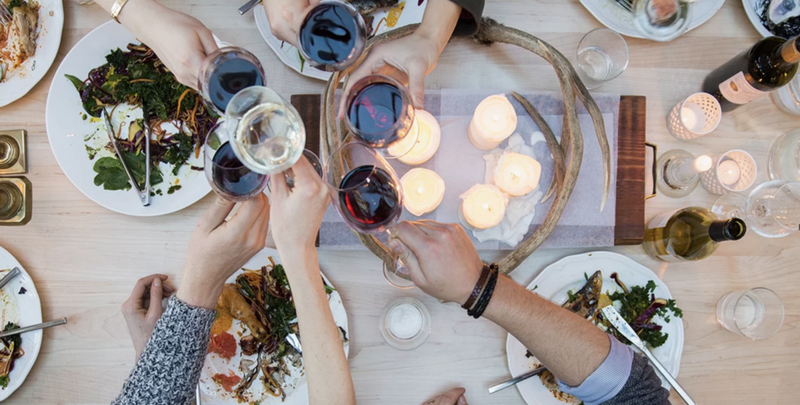 It looks like a bottle of wine, but it’s really a…Vindle, the Wine Bottle Candle! Give this unique gift to your wine-lover that will be enjoyed for hours after the holidays are long over. Soy wax in various “varietals” such as Sangria, Cabernet, and Chardonnay is poured into wine bottles that have been magically sliced in half. The bottom half contains the candle and a handy-dandy match holder resides in the lid (very James Bond). You can also add a wick-dipper accessory to finish off this unique gift. They are made in the USA.